NOTE: Work dates subject to change pending the effects of Tropical Storm Olivia. Punch list work at Hina Lani intersection will have an impact on the flow of traffic. A Notice to Motorists ad will be posted in the paper once work is scheduled. Please continue checking the website for updates. 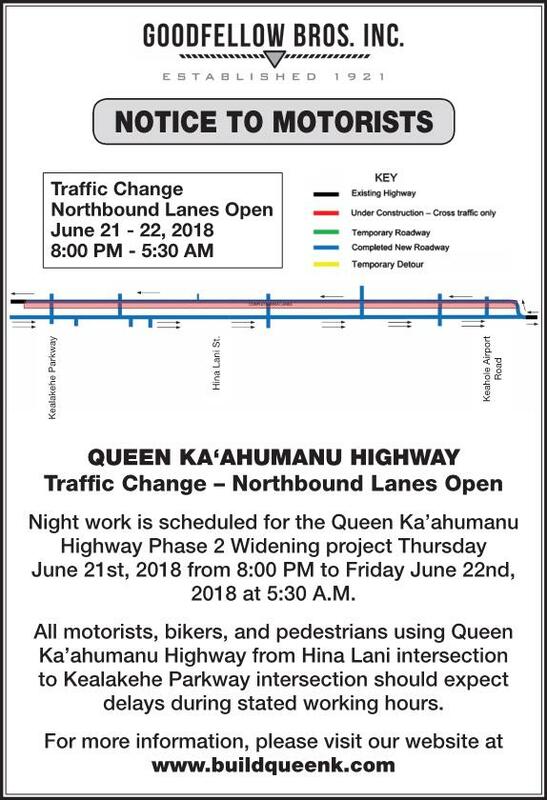 Queen Ka’ahumanu Highway from South of Kealakehe Parkway to North of Keahole Airport Road is still an active Construction Area with a posted regulatory speed of 35 MPH. Although the majority of construction within the travel lanes is complete, we will continue to have workers on the shoulders and in the median on the roadway every day for the next several weeks. Please continue to help us keep motorists, bikers, pedestrians, and our workers safe by respecting the posted work zone speed limits. Please help to keep our roads and highways safe. Finished grading all median areas and placed renaturalized a’a lava rock at all designated locations on project. Trucks will be pulling in and out of work zones near Keahole, Ka’iminani, Hulikoa, Hina Lani, Kaloko-Honokōhau National Historical Park, Honokohau and Kealakehe intersections, please use caution when construction vehicles with flashing hazards and strobe lights are driving in these areas. Temporary lane closures and flagging during the week of August 12th will be occurring during night work hours from 8:00pm to 5:30am. Please plan accordingly. Please watch for announcements regarding work that will affect traffic on Queen Kaahumanu Highway and its side roads. Message boards will be put in place several days in advance of work, and temporary traffic controls will be in use. There may be notifications in West Hawaii Today. Please stay alert for changing conditions and drive safely. With the ongoing road work, please anticipate possible delays and wait time on the highway. We apologize for any inconvenience and appreciate your understanding. The Queen Ka’ahumanu Highway from South of Kealakehe Parkway to North of Keahole Airport Road is still an active Construction Area with a posted regulatory speed limit of 35 MPH. Although the majority of construction within the travel lanes are complete, we will continue to have workers on the shoulder lanes and in the median of the roadway every day for the next several weeks. Please continue to help us keep motorists, bikers, pedestrians, and our workers safe by respecting the posted work zone speed limits. In addition, please remember that areas not open to traffic are active work areas. For your own safety, these areas are currently closed to the general public for all vehicular traffic and pedestrian traffic including mopeds, walking, biking, and jogging. Southbound striping, rumble strip and landscaping activities are ongoing and will continue over the next several weeks. Traffic changes and flagging operations will be present. Please mind all advanced warning signage and stay alert for changing conditions. Trucks will be pulling in and out of work zones near Keahole, Kaiminani, Hulikoa, Hina Lani, Kaloko-Honokōhau National Historical Park, Honokohau and Kealakehe intersections, please use caution when construction vehicles with flashing hazards and strobe lights are driving in these areas. To be published in West Hawaii Today: 7/10, 7/11, and 7/12/18. Southbound top lift asphalt paving, striping and pavement marker activities are ongoing and will continue over the next several weeks. Traffic changes and flagging operations will be present. Please mind all advanced warning signage and stay alert for changing conditions. Trucks will be pulling in and out of median work zones near Keahole, Kaiminani, Hulikoa, Hina Lani, Kaloko-Honokōhau National Historical Park, Honokohau and Kealakehe intersections, please use caution when construction vehicles with flashing hazards and strobe lights are driving in these areas. 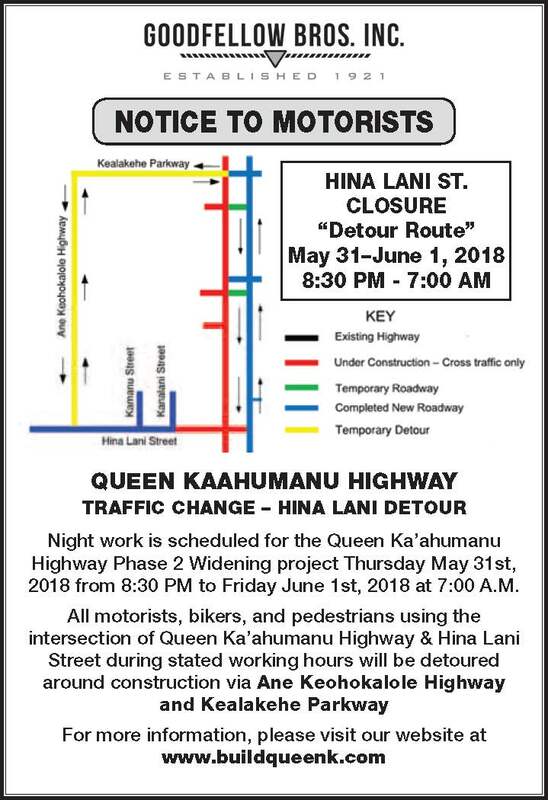 The intersection of Hina Lani Street and Queen Ka’ahumanu Highway is scheduled to be re-constructed the night of Thursday, May 31, 2018. The intersection will be closed to all thru traffic from May 31st at 8:30 PM to June 1st at 7:00 AM. During the closure a detour route will be marked by orange signs with directional arrows. All vehicular, bicyclist, and pedestrian traffic will be routed around construction via Ane Keohokalole Highway and Kealakehe Parkway. Please plan daily commutes accordingly. 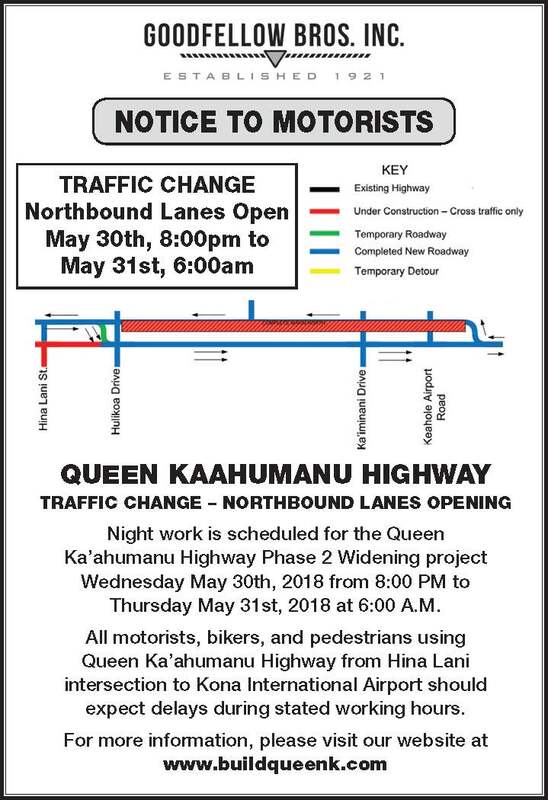 Completed Northbound travel lanes on the Mauka side of the project will be opened the night of Wednesday, May 30, 2018 to all vehicular, bicyclist, and pedestrian traffic from North of the Hina Lani and Queen Ka’ahumanu Highway intersection to the North end of the project. All public using the Highway to travel North will be crossed over to the completed side of the project by a paved temporary roadway in the median. Minor work may take place in the medians or on the shoulders of this area during the day-time. Night work is expected throughout this area in the future which will have minor impacts on traffic. To be published in West Hawaii Today on: May 15, 16, 17, 2018. As a reminder, Makako Bay Drive is a “Right-In/Right-Out” only intersection. Vehicles driving northbound cannot turn left into Makako Bay Drive. Northbound traffic must drive past Makako Bay Drive and use the left hand turning lane into the newly constructed Kahilihili Street/Kaiminani Drive for access to Makako Bay Drive. Dates are subject to change – watch for official announcements on website, message boards, and West Hawaii Today. Kealakehe Parkway will be closed at night only from March 18 – April 6. We will be installing utilities across the roadway and reconstructing this intersection to transition into Queen Kaahumanu Highway. During this time, a detour will be established via Honokohau Street and Kamanu Street. Hina Lani Street will have temporary traffic controls in place during the night beginning March 18. Flaggers will be directing traffic through the work zone. Please be mindful of advanced warning signs and drive slowly. Upcoming night work at Hulikoa Street intersection will affect traffic in the area. Notification of work time and dates will be provided to the public via West Hawaii Today and message boards on the roadway. 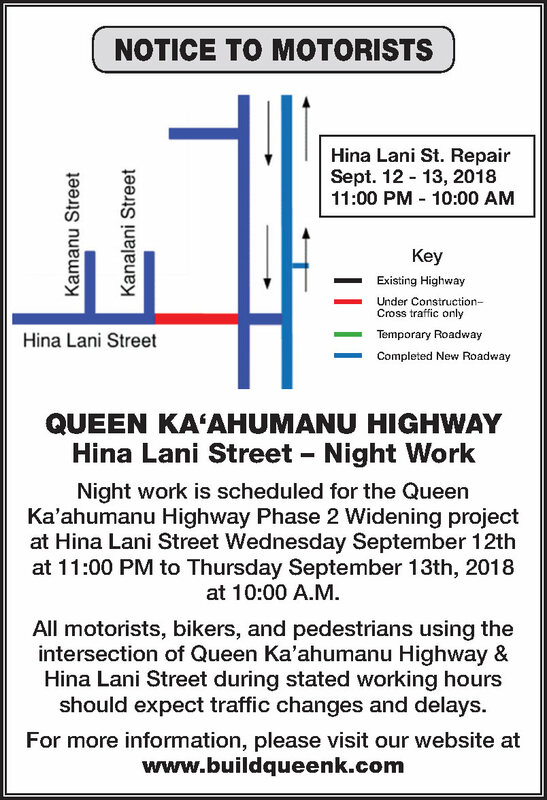 Upcoming night work at Kaiminani Street intersection will affect traffic in the area. Notification of work time and dates will be provided to the public via West Hawaii Today and message boards on the roadway. 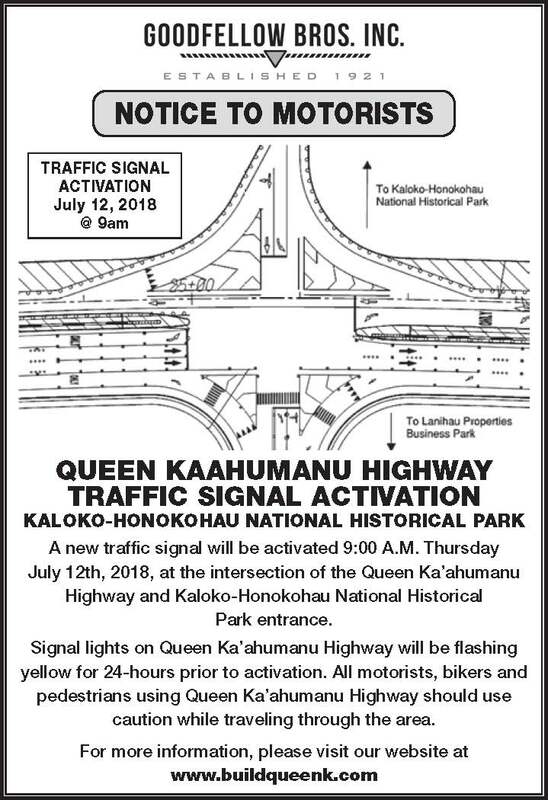 Please watch for announcements regarding work which will affect traffic on Queen Kaahumanu Highway and its side roads. Message boards will be put in place several days in advance of work, and temporary traffic controls will be in use. There will also be notifications in West Hawaii Today. Please stay alert for changing conditions and drive safely. As a reminder, Makako Bay Drive is a “Right-In/Right-Out” only intersection. Vehicles driving northbound cannot turn left into Makako Bay Drive. Northbound traffic must drive past Makako Bay Drive and use the left hand turning lane into the newly constructed Kahilihili Street for access to Makako Bay Drive. Trucks will be pulling in and out of median work zones near Kaiminani, Hulikoa, Hina Lani and Kaloko-Honokōhau National Historical Park intersections, please use caution when construction vehicles with flashing hazards and strobe lights are driving around in these areas. Copyright © 2015, Goodfellow Bros., Inc. All rights reserved. - Website by: Blind Renaissance, inc.
Goodfellow Bros., Inc. is an equal opportunity employer.